Go NORTH to Detroit, SOUTH to Windsor: Two cities, one psyche. Although set in British Columbia, CBC Radio and TV Host Grant Lawrence's first book, Adventures in Solitude, celebrates a cherished tradition in the Great Lakes region: the northern family cottage/cabin. This October, Lawrence's second book debuts. It taps into yet another shared love between the Windsor and Detroit, Michigan and Ontario psyches: hockey. 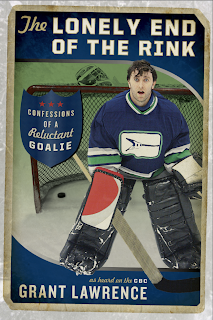 On Mon., Nov. 25, Lawrence will be in Windsor at the Phog Lounge signing copies of The Lonely End of the Rink: Confessions of a Reluctant Goalie. “Like David Sedaris in a Canadian tuxedo, Grant Lawrence’s brutally honest descriptions of his torment at the hands of bullies had me cringing one moment and laughing out loud the next. His passionate and introspective study of his relationship to the game was a real eye opener; as a pro you can easily lose sight of the degree to which hockey holds sway in everyday lives across Canada. I loved it.” - Boyd Devereaux, Stanley Cup champion, Detroit Red Wings.